I often hear from Amazon Web Services (AWS) Partners and customers who are building data lakes on Amazon Simple Storage Service (Amazon S3), consolidating all of their unstructured and structured data into one central, infinitely scalable location. This allows for easy access to that data by users and applications within their organization as part of the data value chain. But to make the unstructured and structured data useful or consumable, you previously had to transform the data into a format or schema that your databases and analytics applications could use. Maybe you processed it with Amazon EMR or another Hadoop framework. Or you leveraged AWS Glue, our fully-managed extract, transform, and load (ETL) service. You could also have used one of our many AWS Partner solutions to transform important data. But what if you need to simplify the data value chain or query your data directly in your data lake? This is where Amazon Athena comes in. Athena is a Presto-distributed SQL engine used to query unstructured data using standard SQL, where you pay only for the amount of data you query. Chartio, an AWS Advanced Technology Partner with the AWS Big Data Competency, recently announced support for Amazon Athena. Their solution allows you to query and visualize data stored in an Amazon S3 data lake using standard SQL. You can also use their visual drag-and-drop SQL layer, which generates native SQL queries for you. Figure 1 – Chartio can generate a visualization using Amazon Athena as a data source. 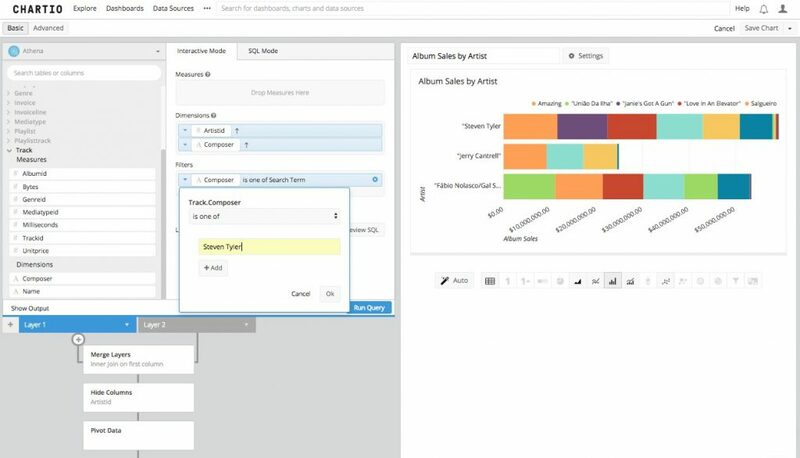 Chartio is a powerful-yet-intuitive business intelligence and data exploration solution that allows organizations to quickly and easily query and visualize data from any source. 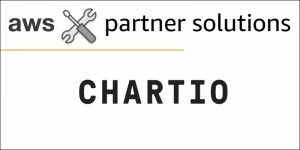 With Chartio’s support for Athena, you no longer have to transform and load your data into Amazon Redshift or EMR before you create visualizations. Now, you can perform ad hoc queries, join Athena across your disparate cloud apps and databases, and build out customized and interactive dashboards to dig deeper into what’s happening in your business. Plus, if there are certain data sets in Athena you know you will query frequently, you can query the data once and utilize Chartio’s Data Stores to save the results to use without having to send additional queries to Athena. You can then join your Athena data with other sources and apply transformations to the data to get your data exactly how you want it. You can easily control access to Athena but still unleash the data to all of your users with Data Stores, without worrying about extra costs.